On 7th February, an open house event was held at the Wasatch Resource Recovery (WRR) facility in North Salt Lake, UT, to mark the start of operations. The facility has the capacity to process nearly 260,000 gallons of liquified organic waste and 330 tonnes of solid food waste each day. The waste is being used to produce renewable natural gas. Bruhat Bengaluru Mahanagara Palike (BBMP) and Karnataka Power Corporation Limited have signed a memorandum of understanding (MoU) to establish a waste-to-energy (WtE) plant in Bidadi. A tender has been issued for the design, build, operation and maintenance of the plant, of which the closing date is 29th March 2019. BBMP will supply 500 tonnes of refuse-derived fuel (RDF) to the plant each day. Catch up with the full details of this project. On 18th February 2019, the UK government announced plans to overhaul the country’s waste system. These centre on boosting the level of recycling, in particular of plastic packaging, and of shifting the costs of this to packaging producers. A plastic packaging tax, levied on producers, was first announced in 2018 and is expected to come into force in 2022. The plans also aim to bring a greater degree of standardisation across the country in how waste is sorted and recycled. The plans are still out for consultation, but the current timetable is for them to form part of a new environment bill in the next session of parliament. Leaving aside the likely unpopularity of a plastics tax, boosting the level of recycling poses a number of challenges. Sorting waste properly for recycling is an issue for householders and local authorities alike, as even given the will to perform the task (not a given), it is often unclear which plastics can be recycled, and in what ways. The data presented below would seem to suggest that the UK could do with more capacity for recycling plastics, with a particular need for innovative solutions to the problems of gathering and sorting. While the ever-looming Brexit issue would appear not to be a major issue for the export of plastics to be recycled in the EU, and therefore such trade will continue, there is an opportunity for more local capacity. This is another prime example of the commercial possibilities of waste as a resource with a value, rather than as just an environmental blight to be dealt with as best it can. What can be said about the current state of UK plastic recycling? The graph below shows the reported tonnage of plastics recycling across the leading European markets. 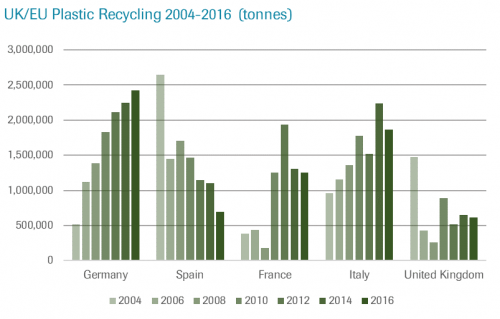 The data from year to year is often erratic, but Germany, Italy and France are the major plastics recyclers, with strong growth in the tonnage recycled in all three across the 2004-2016 period. Spain is different, as the figure appears to have fallen sharply from a very high level in 2004. 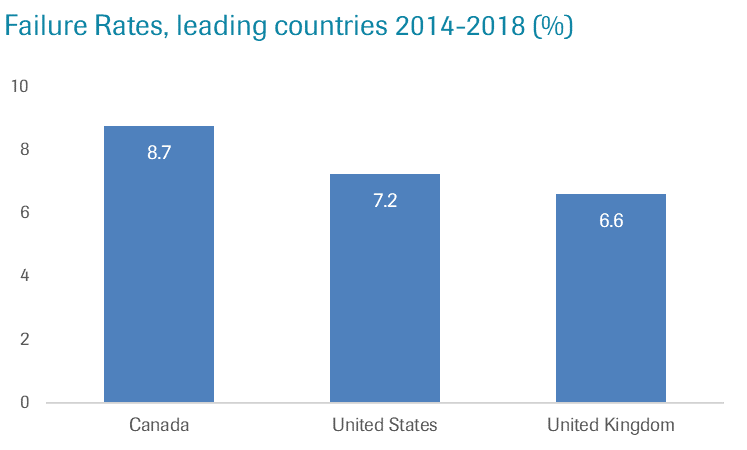 There isn’t much of a trend in the UK data, but the overall amount of plastic recycling appears to be significantly lower than in the major continental markets. The reason for this discrepancy is not wholly clear, given that the UK’s overall recycling rates are generally high in EU terms. The simplest answer may be best; that there is a lack of domestic capacity for recycling of plastics. The UK may also rely more heavily on exporting plastics to be recycled. It exported just under four million tonnes of non-hazardous waste to the EU in 2016, although a plastics breakdown is not available. There were four leading export destinations; the Netherlands, Sweden, Germany and Denmark. These accounted for 96% of UK waste exports to the EU that year. What plastics recycling activity is recorded in the AcuComm database? Since 2013, there have been 22 project investments specialising in plastics recycling. These are worth an estimated US$276 million, or US$13 million each. The total estimated tonnage capacity is 537,021, or around 76 tonnes per day per plant. Of the 22, 15 are operational, with the remaining seven due to come into operation by the end of 2022. It is noticeable that many parts of the country have no dedicated facility nearby. 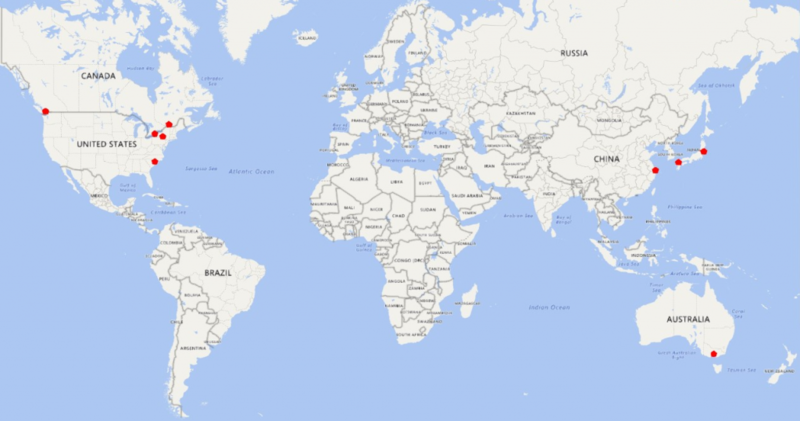 The map below shows the location and status of all 22 known projects. Click here to explore the full detail of each. The launch of the US Department of Energy’s first lithium-ion battery recycling centre, called the ReCell Center, signifies the growing importance of this relatively new sector. 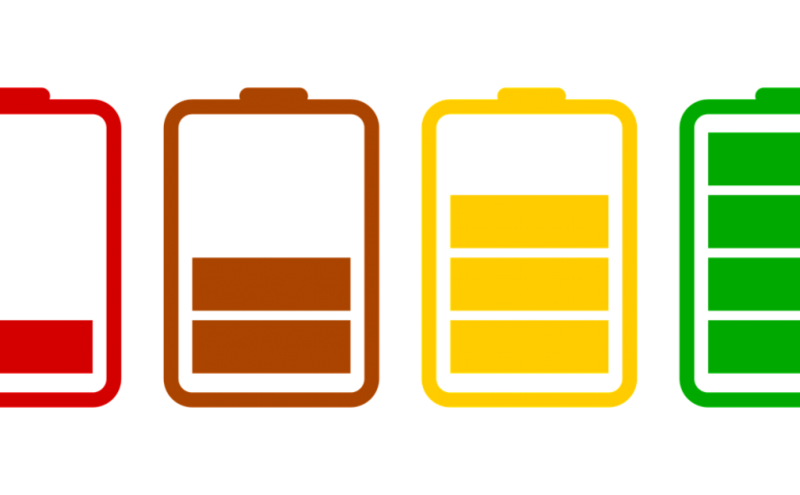 The use of lithium-ion batteries is growing rapidly, with demand from the electric car industry now adding to consumption by the smart phone and consumer electronics market. Recycling obviously makes sense from an environmental perspective, but there are commercial imperatives driving interest in lithium-ion battery recycling, such as recovering valuable materials (cobalt and lithium) and guaranteeing the supply chain. Umicore is one of the pioneers of recycling lithium-ion batteries having provided recycling services since 2006. Today, with an installed capacity of 7,000 tonnes per year, the company’s UHT furnace in Hoboken, Belgium is one of the largest dedicated recycling installations for Li-ion and NiMH batteries in the world. In 2012, the German Government provided funding for LithoRec II, a research project for recycling lithium-ion batteries from electric vehicles and by the end of 2015 a pilot plant had been put into operation. Today, a commercial-scale recycling plant is operated by Duesenfeld GmbH in Wendeburg. The Hoboken and Wundeburg facilities suggest that Europe has been at the forefront of this sector, with the rest of the world now playing catch-up. AcuComm’s WasteView Projects database holds details of ten lithium-ion battery recycling projects covered since 2013, including plants in Australia, Canada, China, Japan and the US (see map). Written by Ian Taylor, Senior Editor & Research Consultant. US$5,059 million worth of projects were covered by our researchers last week, including 18 new additions and 26 updates. Pyrolysis facilities – including three projects covered in the last week. 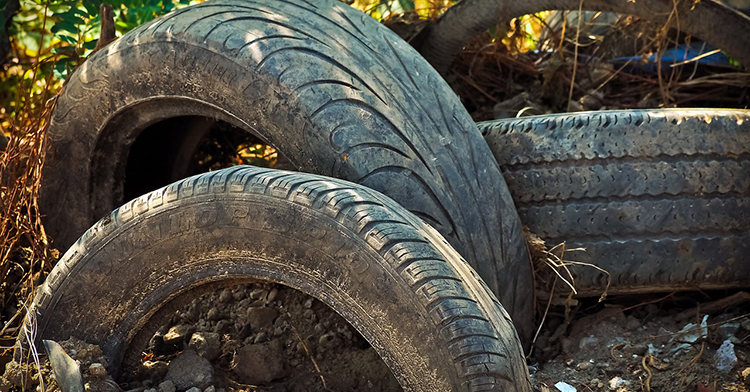 Tyre recycling in Europe – including updates to a project in the UK and a new plant in Poland. Waste projects in North Africa – including new updates to waste management projects being undertaken in Morocco and Egypt. Cartiera di Ferrara is working on plans to construct a waste-to-energy (WtE) pyrolysis plant and convert a mothballed paper machine to coreboard production. 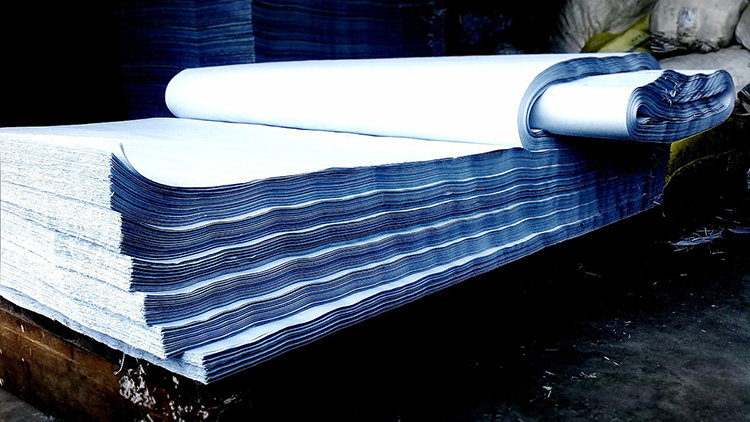 The facilities will be located at the Burgo paper mill in Duino Aurisina. Due to its low environmental impact, the project will not be subject to an environmental impact assessment (EIA). When complete, the WtE facility will treat around 22,000 tonnes of waste from the paper production process and turn it into steam. Earlier this month, it was revealed that E.ON Sveridge is planning to build a new biofuel-fired district heating plant in Norrköping. KPA Unicon has been awarded a contract for the delivery of its Unicon WT70 bioenergy plant with a capacity of 70 MW. The facility will also have another 70 MW boiler and pellet system. Groundbreaking is expected to take place in autumn this year, with operations commencing at the start of 2022. Last month, contractor Jos Scholman, the Hoogheemraadschap De Stichtse Rijnlanden (HDSR) water board, government body Rijkswaterstaat (RWS) and waste management company Attero jointly announced plans to start a trial project in February for the generation of biogas from roadside and canal-side grass. The trial will last six months and should generate knowledge about the yield and quality of biogas and the quantity and composition of the residual product (digestate) when grass alone is used. The special feature of this trial is that there is no manure involved in the fermentation process, which is usually the case. A previous study by Jos Scholman in Utrecht revealed that the maintenance of roadsides, public gardens and ditches yielded 60,000 tonnes of grass and 1,000 tonnes of water plants each year, all of which was composted. If successful, the new trial will not only lead to the production of biogas from this resource, while also eliminating the requirement to collect and transport large quantities of manure and slurry, but also prevent the redistribution of litter and the reintroduction of invasive species such as knotweed back into the soil via traditional composting methods. 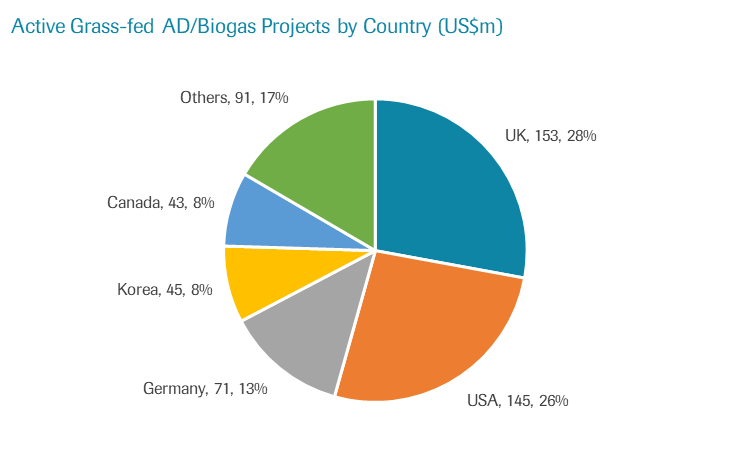 AcuComm currently lists 35 active AD/biogas projects which principally involve grass and related feedstocks, but do not rely on animal manure. These have a combined total value of US$548 million, or US$16 million each on average. Total average power generation is 75 MW, or around 2 MW per project. The bulk of current investments are in the UK or USA, with Germany, Korea and Canada also being significant. I’d guess that shooting polar bears isn’t high on most people’s lists of environmentally aware activities. Yet this is what may be happening soon in the far north of Russia. Why, and what does this have to do with waste management? 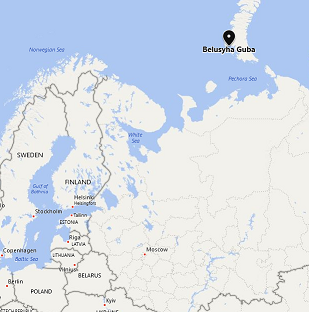 Belushya Guba is located on Yuszhny Island, in the far northern Novaya Zemlya region of the Russian Arctic. It is the largest settlement in the region, despite having a population of only around 2,000. Its historic role was as a support to the Soviet military, although in recent years there have been attempts to diversify its economy. Being so remote and surrounded by wilderness, the town has never developed any waste management facilities. Rubbish from households and businesses is simply taken to an open-air dump site just outside the town. In late 2018, this gave rise to an unexpected problem for the town’s inhabitants as dozens of polar bears appeared in its streets and, yes, at the waste dump. They were seemingly attracted by the smell and the prospect of food. They look cute, but in such large numbers can be aggressive and present a danger to the town’s residents. Such an influx is unprecedented, according to the locals. The town authorities have declared an emergency over the issue, and, while they are looking at all other options, have not ruled out the ultimate need for a cull, as the bears appear unfazed by other means of dispersing them. Polar bears are an endangered species and shooting them would be as illegal in Russia as anywhere else. One obvious measure is the closure of the waste dump and its replacement with something less attractive to bears. In February 2019, the authorities announced that a waste incinerator is to be built at Belushya Guba. This had been planned for 2024, but the current bear invasion seems to have concentrated minds, and the incinerator is now due to open next year, in 2020. The plant, when built, is unlikely to be particularly large and as yet we have no information regarding contracting/supplying companies involved (see here for the AcuComm project listing). The story caught my eye for a number of reasons. Firstly, Belushya Guba is one of the most remote places on earth, yet even here there is awareness of the need for the proper, modern disposal of waste. Secondly, here’s an unexpected driver for investment in waste facilities. There are few of the normal pressures of population growth, economic development, space, environmental rules or power/heat generation. Just bears. Without them, the inhabitants could presumably have continued happily flinging their waste into the tundra indefinitely. But to deal with the bears in an environmentally responsible way, something needs to be done, and that means waste investment. Thirdly, building a modern waste plant, even a small one, is such a remote and inhospitable area will surely present some unique logistic and technological challenges. Finally, yes, it has polar bears in it. That’s a first for the AcuComm database, even though we cover waste sector investments in 165 countries around the world. Here’s hoping the story has a happy ending, for both bears and townsfolk. US$3,442 million worth of projects were covered by our researchers last week, including 16 new additions and 30 updates. 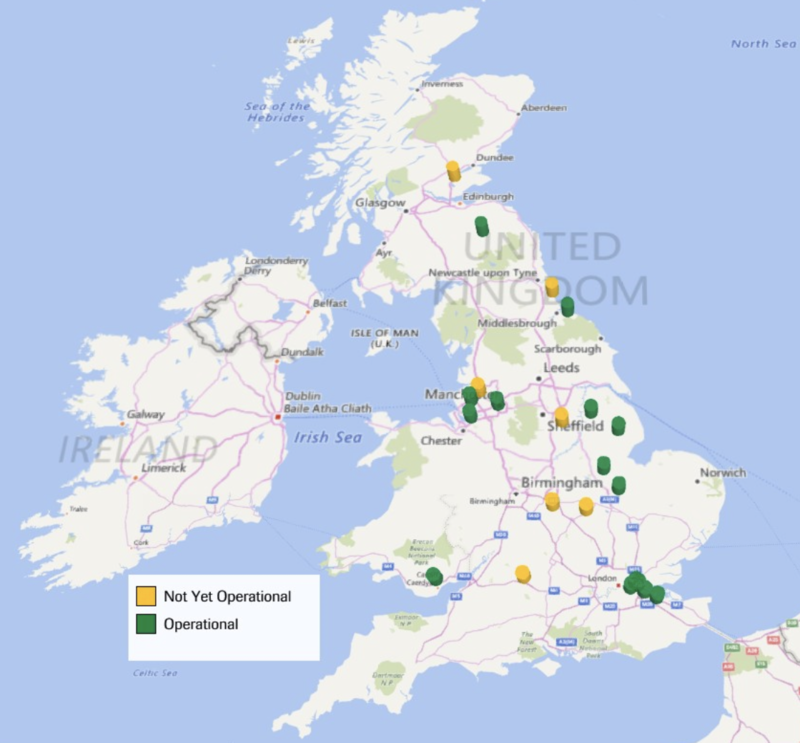 Active plastic recycling plants worldwide – including the announcement of the expansion of a facility in Lincolnshire, UK. Landfill investments in the Middle East – including a project which has been put to tender in Oman. UK EfW projects with planning approval – including updates to two projects in the last month. Eggersmann Recycling Technology has signed a contract with Faruk for the supply of its newly-developed MSW drying system. It will be supplied to the new mechanical biological treatment (MBT) plant that is currently being constructed in Sulaymaniyah. When operational, the facility will have an annual throughput capacity of 380,000 tonnes and will produce refuse-derived fuel (RDF) to be used at Faruk’s cement plant. The government of the Council of Ibiza has reported that it is constructing a waste treatment plant at the Ca na Putxa landfill. It will process MSW, organic, sludge and packaging waste. The facility, which is due to be completed in 2020, will be split into three main processes: selection, biomethanisation and composting. This week I’d like to talk about failure. Or to put it another way, what ways do we have at AcuComm to analyse the likely success of any given waste sector investment, and what conclusions can be drawn from this analysis? It’s a worthwhile exercise for anyone interested in plotting the current and future shape of the global waste management sector. Between 2014 and 2018, AcuComm reported on 5,161 waste investments around the world. Of these, 200 have since been confirmed as either cancelled, indefinitely postponed or no longer operating. This equals 3.9% of the total. But the true figure is likely to be a bit higher than that, as there is naturally a time lag between a project’s announcement and its cancellation. 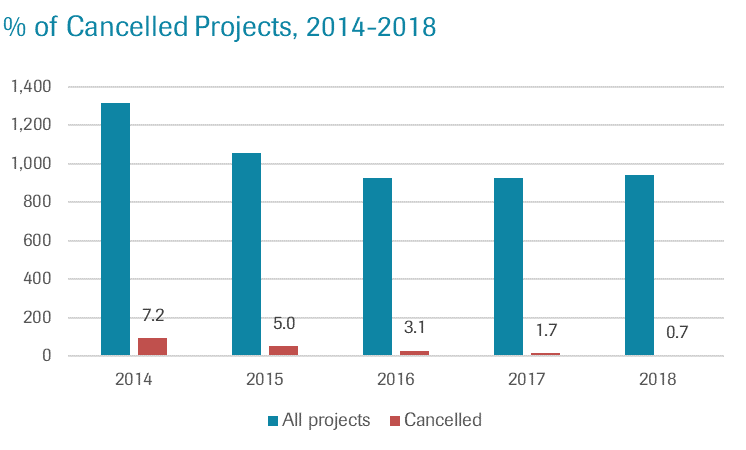 The confirmed failure rate for projects announced in 2014 is 7.2%, as of February 2019, while for projects recently-announced in 2018, it is only 0.7%. The AcuComm database shows a clear inverse correlation between the innovativeness of a project and its chances of success. 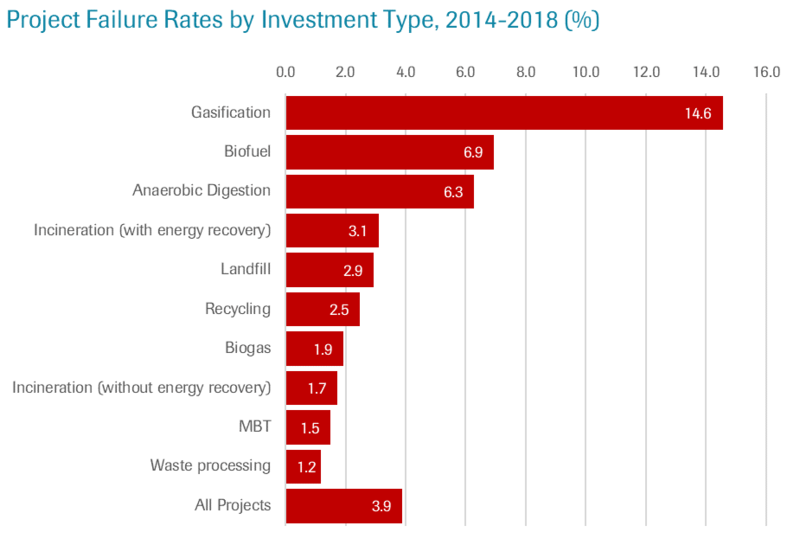 By far the riskiest forms of investment in the 2014-18 period were projects involving gasification and related technologies. We reported on 151 of these, 22 of which have been confirmed cancelled; a failure rate of 14.6%, compared with the 3.9% average. Other above-average failure rates can be seen in the biofuels and AD/biogas sectors, at 6.9% and 4.3% respectively. In contrast, incineration projects had a failure rate of 3.1%. Over the 2014-18 period, three countries account for the highest level of failure rates. Among the major investment markets, Canada is the highest, with 18 failures out of 206, equal to 8.7%. Next is the USA with 69 out of 955, or 7.2%, and the UK with 34 from 516, or 6.6%. Failure rates in leading continental European markets appear to be far lower, as indeed they are also in Asian markets such as China or Japan. There are numerous factors in play here. On the face of it, it’s counterintuitive to expect Canada to be an inherently riskier market than France or China. Richer, more developed markets have the money to invest in new technologies and are often home to those companies proposing more advanced technological solutions. Conversely, these markets often have the greatest pitfalls in the form of planning or environmental regulatory hurdles. The greater the level of private sector involvement in the provision of waste management services, the ‘riskier’ projects will be put forward. Companies in these areas are, initially at least, more open to divulging and discussing their proposed activities, not least because they have a greater need to attract and retain backing from investors. This is doubly true in markets where there is significant private involvement in the provision and management or waste services (as opposed to construction or equipment supply & maintenance). In this case, there is often far more openness about future planning. Where services are predominantly state-run, there is often less access to information about ongoing projects and, quite possibly, a greater degree of conservatism when deciding which solutions and technologies to opt for. In summary, some markets are more likely to be profitable locations for more advanced technologies, and these can be expected to experience the highest failure rates. At the same time, some markets are more open to provision of data by suppliers and management corporations. Finally, the heartening news is that the great bulk of waste sector investments do eventually become operational. The AcuComm database is a great way to gauge the environment for a wide range of investments across the sector.